Cotton+Steel Thread by Sulky is a 50 Wt., 2-ply thread made from 100% Egyptian-grown Giza cotton. This thread is an all-purpose weight that is perfect for nearly any project. This particular collection was hand-picked to pair perfectly with Cotton+Steel's brand new Lagoon fabric collection by designer Rashida Coleman-Hale. In lush colors, Rashida Coleman-Hale takes you on a journey through a tropical jungle full of playful lemurs, swimming elephants, and waving palm fronds in her Lagoon fabric collection. 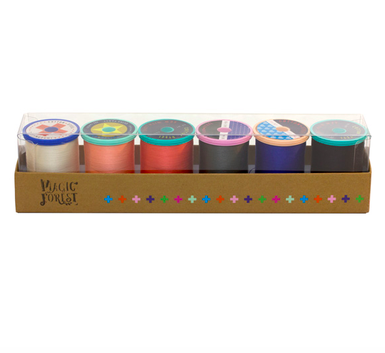 Pair this perfectly matched 6-pack of Cotton+Steel Thread by Sulky with it and the creative possibilities are endless!